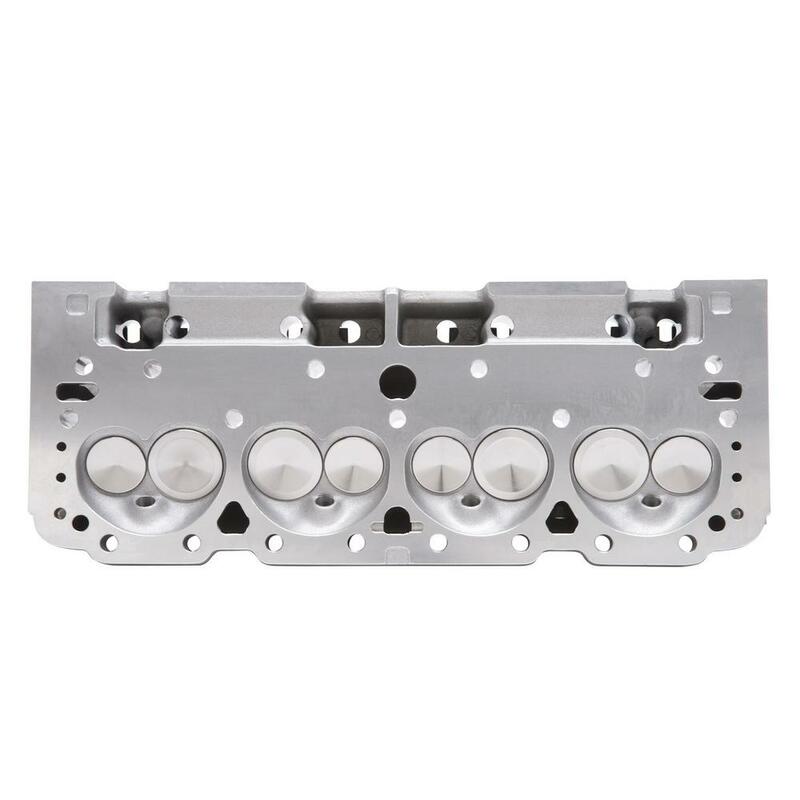 Cylinder Head Specifications: Combustion chamber vol: 64cc; Intake runner vol: 200cc; Exhaust runner vol: 80cc; Intake v. diameter: 2.02"; Exhaust v. diameter: 1.60"; V. stem diameter: 11/32"; V. guides: Maganese bronze; Deck thickness: 5/8"; V. spring diameter: 1.46"; V. spring maximum lift: .575"; Rocker stud: 3/8"; Guideplate: Hardened steel; Pushrod diameter: 5/16"; V. angle: 23; Exh. port location: Stock; Spark plug fitment: 14mm x .750 reach, gasket seat. 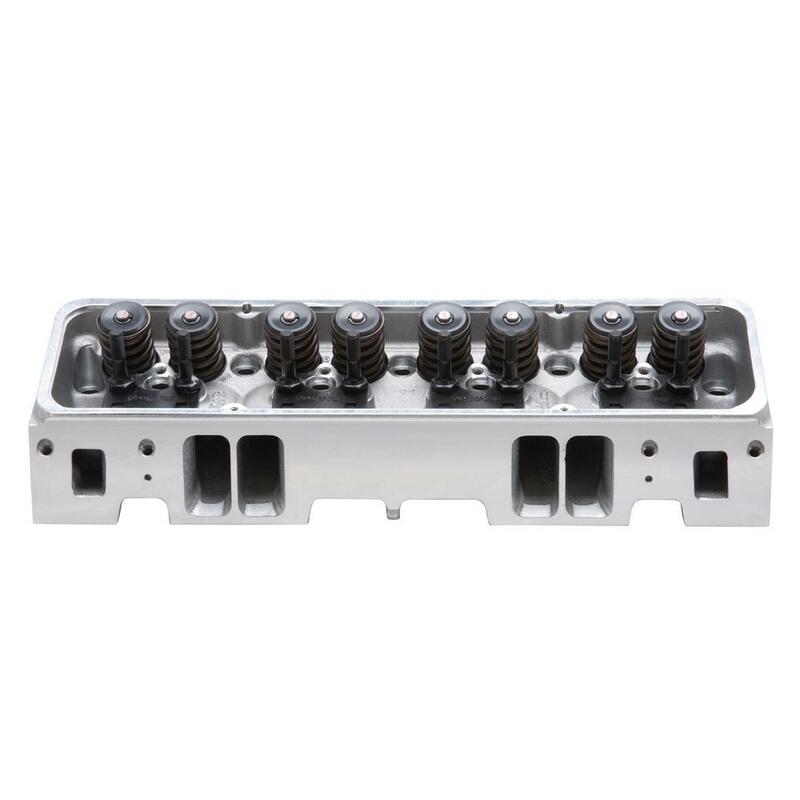 Edelbrock E-Tec Cylinder Heads are replacements for 302, 327, 350 & 400 c.i.d. S/B Chevy engines with "Vortec-style" manifolds. They feature an LT1-style raised runner intake port design for increased air-flow and ultimate performance. A unique combustion chamber design positions the spark plug closer to the center of the cylinder, promoting a more efficient combustion resulting in more power. These heads include an adjustable rocker stud and guide plate set-up for use with adjustable rockers or washers to properly position the stud height to accommodate factory style self-aligning rocker arms. 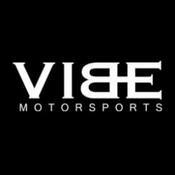 They have 20% more exhaust flow than cast iron Vortec heads, great performance up to 6000 rpm and can produce 9.5:1 compression with stock pistons in 350 cubic-inch engines. 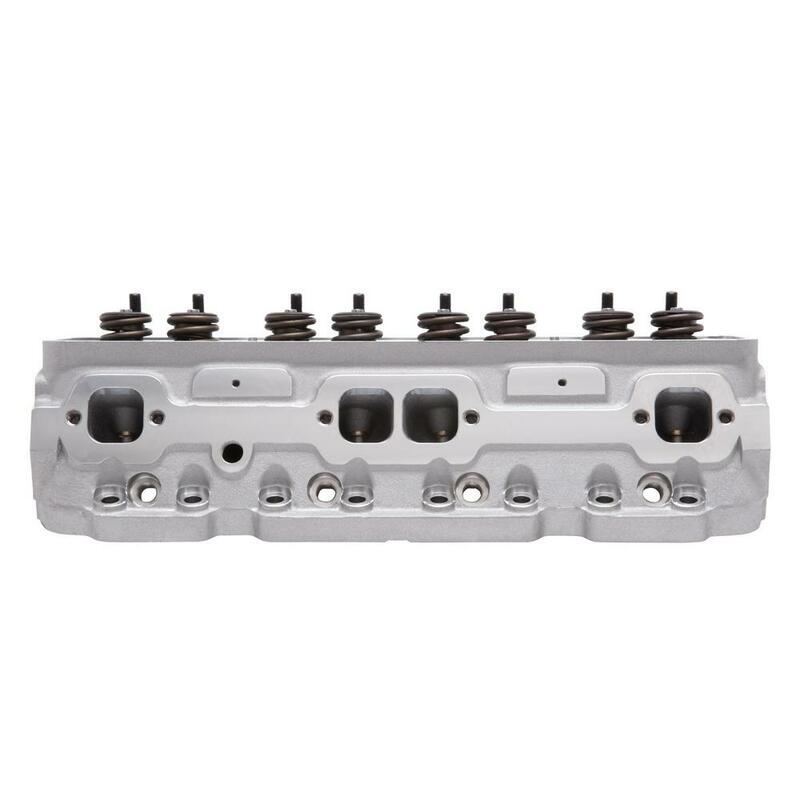 RPM E-Tec cylinder heads are dual-drilled and will accept 1987-95 centerbolt and/or 1986 & prior perimeter flange mount valve covers and most stock exhaust manifolds. INSTALLATION NOTE: Bare heads will have valve guides and seats installed, but will require final sizing and a valve job to match the valves you will be using. Recommended spark plugs are Champion RC12YC or equivalent 14mm x 3/4" reach with flat gasket seat. 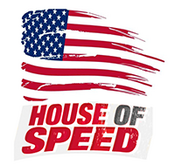 To use stock rockers on small-block Chevy heads, .100" longer than stock pushrods are required. 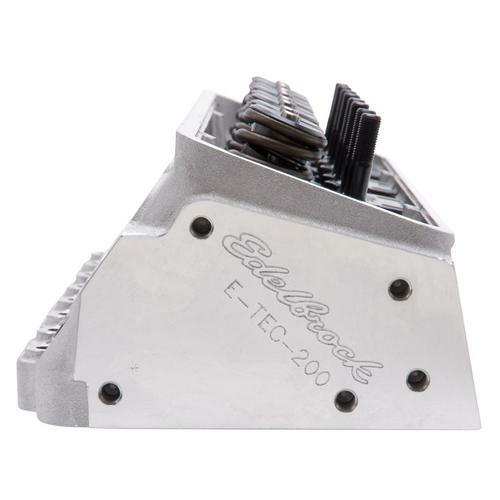 Edelbrock pushrods #9629 are recommended. Use Head Bolt Kits for easy installation. 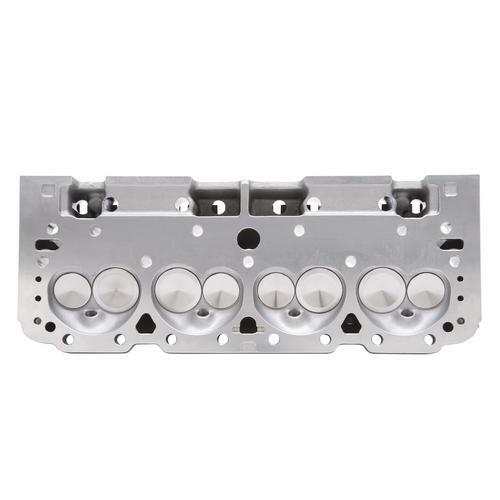 S/B Chevy heads may not be used on engines with less than 4" bore (262, 265, 283, 305, 307 c.i.d.) except with cams having less than .450" valve lift.